Is there a danger in assuming that all externalities are mapped? Anything not on that map gets ignored. As the map adjusts I suppose we get closer and closer to "the ultimate invisible dependence" - the last thing left off? This 'anything not on the map gets ignored' problem is real, important, and - unfortunately - it can also derail a mapping process before it gets started. People give up. "All models are wrong, some models are useful." Better a map scratched onto rock or wood than none at all. We have what we need. In communities around the globe, many groups and organisations already track outcomes they care about, including those ignored by our current economic systems, even if it's not all of them. We just have a hard time knowing and finding the ones we need, when we need them. The local and regional scale is where most desired - or actual - impacts and outcomes, are usefully seen and gathered. Trouble is, we are at (past?) the point now where we need global access. We need to be able to see our complexities, but we don't have a good view. In the face of the various chaotic transitions we are seeing world-wide at the moment, many people are panicking. This can show up as denial, as depression, and as despair, which we all cycle through. This panic can also lead effective, clear-eyed action. Panic can un-stick what's been stuck. Municipal and regional governments and groups are starting to realize that they are the frontlines for many of our crises, and our potential futures. People are gathering, in cities, around bioregions and areas of work they care about, and driving changes that have been stuck for years. For decades. Even centuries..
Part of our transition is a shift from nouns to verbs. You can look across any field of study or industry today and find things moving from a focus on things to a focus on flows. Relationships. Connections. I think of this as a several hundred year transition from mechanistic thinking to ecological thinking. From Descartes to Darwin. "Each individual is a pattern integrity. The pattern integrity of the human individual is evolutionary and not static." 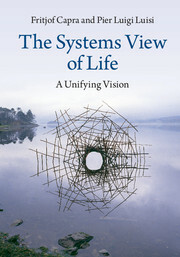 More recently, physicist and ecoliteracy advocate Fritjof Capra teamed up with chemist Pier Luigi Luisi to write The Systems View of Life: A Unifying Vision, as primer on learning to think in this new way. If you're lost, this is a great place to start. For cartographers, strategists, and other complexity wranglers, this shift from nouns to verbs can be seen as a move from strategic planning approaches to dynamic mapping. We don't need a static, perfect map, or a five year plan. No such map exists, or ever will, and in five years we'll all be surprised at something new. This connected, networked world is complex. It's unpredictable. Right now, in the next three months, during this next year, we need to connect people driving changes we care about, people building viable, regenerative communities on the local and regional scale, with the information and resources they need. Fast. Faster than we are currently doing it. The point of dynamic mapping is not analysis, but action. Dynamic mapping requires network leaders. Returning to the conversation from which these thoughts flowed, let's look at the second, implicit problem: what is not measured gets ignored. Historically, this is a huge problem. At its base, this IS the ignoring of verbs, of flows, of relationships, of care-taking and caretakers, of women, of those who serve. Dynamic maps help with this not by mapping and measuring the unmeasurable, but by being dynamic. A community's relationship to its map is of primary importance, not the map as an artifact. By linking the creation of local and regional maps to ongoing, iterative conversations, a dynamic mapping process can be designed to surface and support both updates and changes to a map and the soft, warm relational work of a community's network guardians and caretakers. We don't ignore what can't be measured, we make it a prerequisite. This is Kumu from Kumu on Vimeo. A network guardian/ network weaving maven is June Holley. Essential. And Nora Bateson, liminal space explorer and coiner of "warm data", is pushing systems thinkers who think they're doing it right to expand our understanding of relationships. See her new book, Small Arcs of Larger Circles: Framing through Other Patterns. Want an example of dynamic mapping? A global experiment in network intelligence and engagement. GENIE. GENIE is beginning with a bioregional mapping effort in the Columbia River Basin. We're an an open collective with a global vision. GENIE.earth is building teams and toolboxes to help this work scale across communities and connect for global use. We want to make it faster and easier to implement dynamic mapping practices coherently, collect community intelligence, act and learn. Together. And to scale that learning across. In the Digital Life Collective, we are building another example, a network map for the tech community. We're starting with folks involved with the decentralized web, moving from our demo map to a pilot version this August with a launch at the Decentralized Web Summit. Build this with us, or partner with us and build one for your network(s), by joining the Digital Life Collective and finding us in our team chat in Projects> Network Maps, or emailing the mapping team. Why join the Digital Life Collective? We are our own limits. The limiting factor in all this is not our technological capabilities of the right tools, or finding out some sort of global consensus on the desired outcomes. We have gone from scratching maps on rock and paper to photons and quantum possibilities. Nearly unlimited possibilities lay ahead of us. Our limiting factor is us. We, the people. We need to level up our skills. We need facilitators who can bridge the people-people and the code/numbers-people. We need mappers who enjoy complex adaptive system challenges and network guardians listening for both community coherence and for the nouns and verbs we need to make our dynamic maps useful over time. We need data Jedi to help us use the insights from this work as a force for change. We need to get these mapping tools and processes to the network of networks, the movement of movements, a global linkage for those who act as their community's glue. We need support for those who do the unmeasurable. And, importantly, we need coordination across all those networks of people. So, in the conversation that started this post, when I asked for mappers, I meant it. We are doing this work. We need #AllMindsOnDeck. and expanding that work to bioeregional projects through GENIE (see link below). Where do you work? How do you link and support the mappers and network leaders in communities important to you? ...and in your local communities, everywhere. This Earth is our planet. Let's connect our dynamic, practical maps. Abundant gratitude to @leashless, @goldengus and the teams at @tech_we_trust for catalyzing this (and many a) generative conversation, to @sheldrake and @ppbpdx for being on-deck mappers with me, to all the @kumupowered Jedi and network mavens, to @bortseb for appearing in all the networks, to @whanamura and the @internetarchive for seeing the potential in mapping and fostering engagement with the amazing DWeb community, to @opencollect for powering GENIE, to all the mappers and stewards of thriving resilience and TRCC, to @teamhumanshow for existing, and to @jennifersertl for the wonderful and urgent call for "#AllMindsOnDeck". This work is only possible because of you. Think of me as a knowledge ecologist, collaborative researcher, a network catalyst. When not teaming with the Collective, you can find me on an Aikido mat or hiking a waterfall trail. Come say hello!